…but I'm not here to bore you with that. This book is not about Vornheim, it’s about running Vornheim – or any other city – in a fantastic Medieval setting. And about running it with a minimum of hassle – so you and your players can get to the good stuff…That’s why we called it a ‘Kit’ – you can use it to build your own city, even in the middle of a game. Give somebody a floorplan and they’ll GM for a day – show them how to make 30 floorplans in 30 seconds and they’ll GM forever. We asked Zak Sabbath, the game master of I Hit With My Axe, to make a little book full of the notes he had when running city adventures – and everything he wished he had. 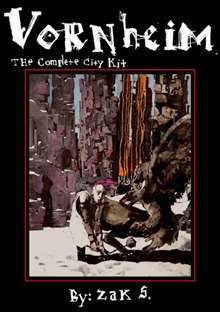 He gave us not only a sourcebook detailing key rules, tables, monsters and places in Vornheim – the city at the center of the Axe campaign – but also a treasure chest of resources for running adventures in any city. Need to know how to get from here to there even if neither here nor there are listed on a map? Even if there is no map? Need a random encounter? Need instant stats for that random encounter? Need to know why there was a random encounter? This book was designed to help you make a city happen now. In addition to details on Vornheim, adventure locations, and player commentary from the I Hit It With My Axe girls, every single surface below this jacket – including the back of the jacket, the book covers underneath, and the inside covers – has been crammed full of tools to help you build and run a city in a First, Second, Third, or Fourth Edition game. Can someone advise me on this product, as I can't quite figure out what it is. It has an odd-seeming flair, with a high-fantasy gothic feel, that doesn't suit me. Yet it also seems to have general city building guidelines? I'm a warhammer player for the most part, so can anyone advise how this might relate to warhammer city adventures? From what I understand it is a kit "...crammed full of tools to help you build and run a city." And while watching Web DM's Swords in the City: Urban Adventures in 5e Dungeons & Dragons they talk about the product along with two other items. Web DM stated it was a nice item to have for on-the-fly use at the table. This title was added to our catalog on May 01, 2011.